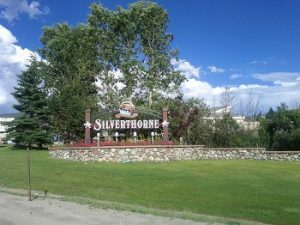 Silverthorne Real Estate offers some exceptional options for vacant land and homesites. Whether it is spectacular riverfront luxury homesite north of Silverthorne, or a sought after mountain lot in Three Peaks near the Raven Golf Course, you will find exceptional vacant land in Silverthorne, Colorado. Contact Justin and Krystal Knott with LIV Sotheby’s International Realty in Summit County, Colorado today to ask general questions about Silverthorne real estate or specific questions about Silverthorne vacant land you view on our website. Your home site has it all. Golf? Overlooks The Raven’s 1st fairway & up the ninth hole towards the Gore Range & hiking trails. Golfers ride downhill in summer; foxes chase each other uphill in winter on cross country trails. Skiing? A Basin, Keystone, Copper, Breckenridge minutes away, and Vail/Beaver Creek are near. Fishing? Gold Medal fishing on Blue River 125 yards. Sailing? Lake Dillon 4 Miles. Solar? South facing for a solar home design on level site. Build your dream! It’s almost yours. 5adf8fcc34e2b5751e57c233 0.74 1000045 Wildernest/Silverthorne Silverthorne Listing Summit 3 miles north of I-70 exit into Silverthorne on Highway 9, left through Three Peaks’ entrance arch. Site on left across from The Raven Golf Course Club House. Driveway access chain between two posts. 3020 Golden Eagle ROAD summit 5adf8f9234e2b574d51af243 1 1 1549941402 1524528000 279000 Marty Frank 5715130 Active Golf Course S1008747 1003499 3020 Golden Eagle ROAD, SILVERTHORNE, Colorado 80498 1550004622 LIV SOTHEBY'S I.R. 14 Land Your home site has it all. Golf? Overlooks The Raven’s 1st fairway & up the ninth hole towards the Gore Range & hiking trails. Golfers ride downhill in summer; foxes chase each other uphill in winter on cross country trails. Skiing? A Basin, Keystone, Copper, Breckenridge minutes away, and Vail/Beaver Creek are near. Fishing? Gold Medal fishing on Blue River 125 yards. Sailing? Lake Dillon 4 Miles. Solar? South facing for a solar home design on level site. Build your dream! It’s almost yours. CO Golden Eagle 3020 Osprey Reserve Sub 1550008396 80498 ListPrice 279000 1549819381 279000 1524600780 289000 ListingStatus Active 1524600780 Active Point -106.0893661 39.6632609 ROOFTOP http://s3-us-west-2.amazonaws.com/apiv1.photos.master/6776-5715130-0-summit.jpg 0 1550008585 http://s3-us-west-2.amazonaws.com/apiv1.photos.master/b633-5715130-1-summit.jpg 1 1550008585 http://s3-us-west-2.amazonaws.com/apiv1.photos.master/e8b0-5715130-2-summit.jpg 2 1550008585 http://s3-us-west-2.amazonaws.com/apiv1.photos.master/663b-5715130-3-summit.jpg 3 1550008585 http://s3-us-west-2.amazonaws.com/apiv1.photos.master/76f7-5715130-4-summit.jpg 4 1550008585 http://s3-us-west-2.amazonaws.com/apiv1.photos.master/4510-5715130-5-summit.jpg 5 1550008585 http://s3-us-west-2.amazonaws.com/apiv1.photos.master/6a37-5715130-6-summit.jpg 6 1550008585 http://s3-us-west-2.amazonaws.com/apiv1.photos.master/df91-5715130-7-summit.jpg 7 1550008585 http://s3-us-west-2.amazonaws.com/apiv1.photos.master/ee34-5715130-8-summit.jpg 8 1550008585 http://s3-us-west-2.amazonaws.com/apiv1.photos.master/9ed6-5715130-9-summit.jpg 9 1550008585 http://s3-us-west-2.amazonaws.com/apiv1.photos.master/c216-5715130-10-summit.jpg 10 1550008585 http://s3-us-west-2.amazonaws.com/apiv1.photos.master/cee3-5715130-11-summit.jpg 11 1550008585 http://s3-us-west-2.amazonaws.com/apiv1.photos.master/821b-5715130-12-summit.jpg 12 1550008585 http://s3-us-west-2.amazonaws.com/apiv1.photos.master/ba1f-5715130-13-summit.jpg 13 1550008585 http://s3-us-west-2.amazonaws.com/apiv1.photos.master/29cc-5715130-14-summit.jpg 14 1550008585 https://s3-us-west-2.amazonaws.com/apiv1.photos.master/cfd2-5715130-15-summit.jpg 15 1549820884 https://s3-us-west-2.amazonaws.com/apiv1.photos.master/0596-5715130-16-summit.jpg 16 1549820884 https://s3-us-west-2.amazonaws.com/apiv1.photos.master/8a73-5715130-17-summit.jpg 17 1549820884 https://s3-us-west-2.amazonaws.com/apiv1.photos.master/e064-5715130-18-summit.jpg 18 1549820884 https://s3-us-west-2.amazonaws.com/apiv1.photos.master/c2bf-5715130-19-summit.jpg 19 1549820884 https://s3-us-west-2.amazonaws.com/apiv1.photos.master/e110-5715130-20-summit.jpg 20 1549820884 https://s3-us-west-2.amazonaws.com/apiv1.photos.master/f693-5715130-21-summit.jpg 21 1549820884 https://s3-us-west-2.amazonaws.com/apiv1.photos.master/cb13-5715130-22-summit.jpg 22 1549820884 https://s3-us-west-2.amazonaws.com/apiv1.photos.master/31d6-5715130-23-summit.jpg 23 1549820884 https://s3-us-west-2.amazonaws.com/apiv1.photos.master/3fd2-5715130-24-summit.jpg 24 1549820884 https://s3-us-west-2.amazonaws.com/apiv1.photos.master/cc10-5715130-25-summit.jpg 25 1524601394 1550008585 1550008596 -3.58 1549819381 Barrie Stimson LIV SOTHEBY'S I.R.